JNU Admission 2019 will be based on entrance exam that will be conducted by National Testing Agency (NTA). 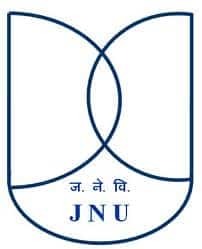 Jawaharlal Nehru University Entrance Exam (JNUEE) will be conducted for admission in JNU to its various Under Graduate and Post Graduate programs such as BA Programme in Languages, MA (History, Geography, Economics, Political Science, Philosophy, M.Sc, MCA, M.Tech (Computational & Systems Biology), M.Phil, and PhD Candidates can submit JNU application form of JNU Entrance Exam 2019. The Application Process is common for all the courses. This page gives details about JNU Admission 2019-20. Senior School Certificate (10+2) or equivalent examination with a minimum of 45% marks. OR Certificates issued by Madrasas (Certificate of Alimiah) mentioned in the Prospectus with at least 45% marks. The first year of Bachelor's degree or an examination recognised as equivalent thereto with at least 50% marks under 10+2+3 pattern of education with adequate proficiency in German. The first year of Bachelor's degree or an examination recognised as equivalent thereto with at least 45% marks under 10+2+3 pattern of education with adequate proficiency in the concerned language. Eligibility for SC/ST: The SC/ST and Physically Challenged (Handicapped) candidates who have passed the qualifying examination irrespective of their percentage of marks are eligible to appear in the Entrance Examination. JNU Application Form 2019 for JNU entrance exam is available from 15 March 2019. Students desirous of taking admission in JNU in BA (H) 1st & 2nd Year, MSc, MCA, M.Sc, MTech, MPhil, PhD, Integrated M.Sc have to fill the JNU Application Form to seek admission in into these courses. Candidates wishing to apply for Certificate of Proficiency, Diploma of Proficiency, Advanced Diploma in Mass Media courses are also required to fill the common JNU Application Form. JNU application form has to be filled and submitted online only. Candidates need not to send the application form or any other document to the university. However, it is advisable to take a printout of the application form for future reference. The JNU Admit card for the entrance exam will be released on 10 May 2019. Candidates are required to take the JNU Admit Card to the Examination Centre with a copy of latest passport size photograph. It is to be noted that only those candidates will be allowed to appear in the JNU entrance exam whose names appear in the roll-list available with the examination centre. Candidates are advised to keep JNU Admit Card at a safe place. A link to download JNU Admit Card will be provided on this page once it is released. Candidates will appear in JNU Entrance exam for JNU Admission 2019 in May 2019. Only the candidates carrying the JNU Admit card will be allowed to give the JNU entrance exam. The JNU Entrance exam will be conducted for all the JNU courses mentioned on this page. The courses for which the JNU Entrance exam is conducted includes both graduate and postgraduate courses. The Entrance Examination fee for B.A.(Hons.) 1st year and 2nd-year programmes for candidates. Check the application fee for all the courses and categories given below. JNU Result will be declared in the last week of February 2019 and include the list of candidates eligible to be called for viva-voce. JNU Viva-voce will be conducted by the third week of March 2019. However, candidates are requested to check the University website regularly for the exact date of the viva-voce. No separate communication will be sent in this regard. The cutoff marks for the JNU entrance exam has been released and given on this page. Three JNU Cut Off lists have been declared for JNU Admission 2019-20. JNU Entrance Exam for B.A.(Hons.) 2nd year will be conducted in the language in which the admission is sought. The complete set of question papers for the JNU Previous Year papers can be found in the link given below. The questions in the paper will be of objective type within the broad framework of General Knowledge, General English and elementary knowledge of the culture and civilisation of the language/country concerned and aptitude for language skills. Question paper for JNU entrance exam will be set in respective foreign language and answers also are to be given in that foreign language. Candidate should have adequate proficiency in spoken and written language concerned. Candidate should be familiarised with the culture and civilisation of the country concerned. The Jawaharlal Nehru University constituted under the Jawaharlal Nehru University Act 1966, (53 of 1966) came into existence in 1969. The basic academic units of the University are not single discipline departments but multi-disciplinary Schools of Studies. It is very important for a candidate who is going to give the JNU entrance exam refers to a good book for preparation of JNU entrance exam. The book should cover all the important concepts and should also be easily understandable. Candidates can refer to the link given below to get a good book for preparation of JNU entrance exam. The reservation for the admission is as per the norms of Government. Candidates belonging the SC/ST/PH/OBC categories are eligible for the reservation as per the details below. SC/ST: Up to 22.5 per cent (15% for SC and 7.5% for ST) of seats are reserved for SC/ST candidates respectively. OBCs- 27% seats are reserved for OBC candidates (non-creamy layer). For MPhil Programmes: A relaxation of 5% marks from 55% to 50% or an equivalent relaxation of grade, may be allowed for those belonging to SC/ST/OBC (non-creamy layer)/Differently-abled and other categories of candidates as per the decision of the UGC. For PhD Admission: A relaxation of 5% marks from 55% to 50%, or an equivalent relaxation of grade may be allowed for those belonging to SC/ST /OBC (non-creamy layer)/Differently-abled and other categories of candidates as per the decision of the UGC. For M.Tech, MPH, PGDE, M.A., M.Sc., MCA, B.A.(Hons. )2nd year, B.A.(Hons. )1st year and part-time programmes: The SC/ST and Person with Disability (PWD) candidates who have passed the qualifying examination irrespective of their percentage of marks are eligible to appear in the Entrance Examination. All OBC category (non-creamy layer) candidates are eligible for 10% relaxation in the percentage of marks in the qualifying examination in relation to open category. School of Language, Literature & Culture Studies in JNU is the only institution of its kind in the country where facilities for teaching and research in most of the major foreign languages are available. The courses aim at developing competence and proficiency in spoken as well as written language. To facilitate students coming from varying backgrounds with the medium of instruction other than English at their Bachelor’s/Master’s level, the University has inbuilt facilities for remedial courses in the English Language in order to enable them to strengthen their foundation in English as well as to cope with their academic and research programmes adequately. JNU Admit Card 2018 - JNUEE Hall Ticket Released!